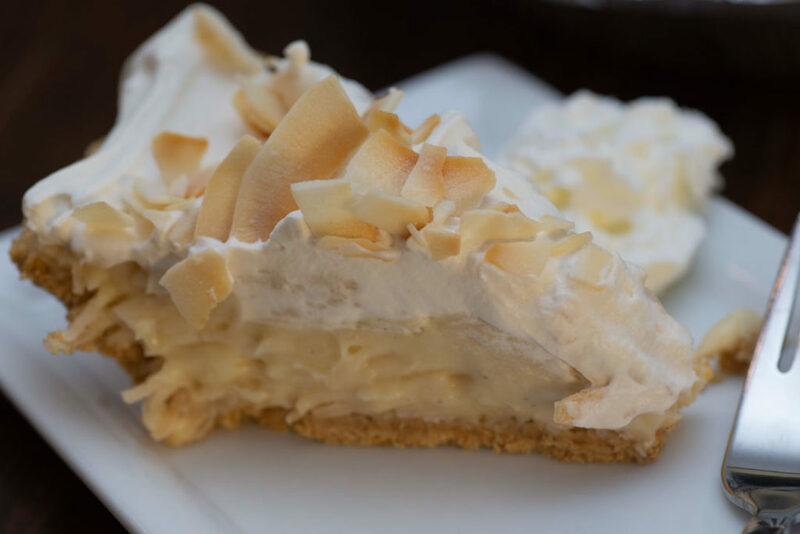 The Best Coconut Cream Pie Ever….no really…. In a large bowl, thoroughly combine eggs, salt, corn starch and sugar with ¼ cup of the milk and set aside. Heat the coconut milk and evaporated milk in a heavy bottomed pot until it comes to a slow bowl and turn the heat down to medium low. Slowly drizzle 1 cup of the heated milk mixture into the egg and starch mixture while continuously stirring with a wire wihisk. Now add the egg and starch mixture into the pot and stir until it thickens into a pudding like consistency. Add in 1 cup of the toasted shredded coconut. Fill the pie shell with the custard and chill for at least 4 hours before serving. Finish with sweetened whipped cream and garnish with toasted coconut chips. I think foodies like like to believe that they coined the term and the concept of fusion foods. But the reality is that fusion foods have been around for centuries if not millennia. And this weeks recipe is really a classic example of what happens when two cultures combine techniques and ingredients to create a whole new food experience. 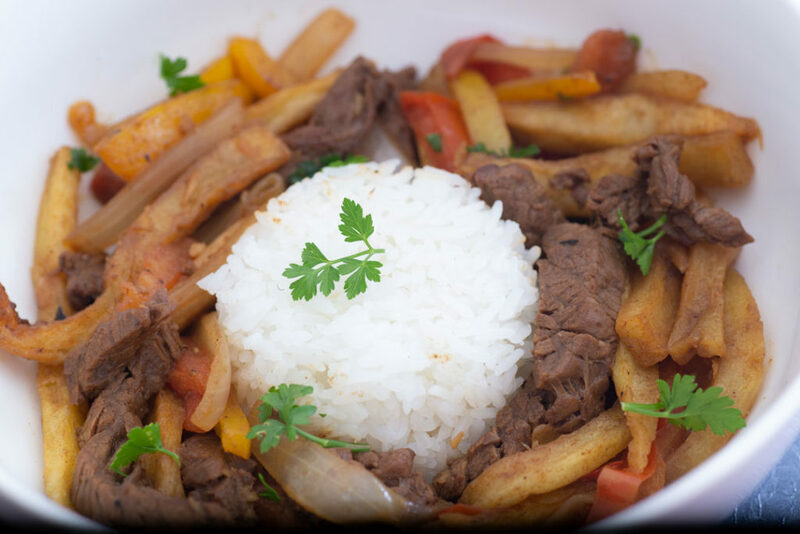 Lomo Saltado is a Peruvian dish that exemplifies fusion cooking. Beef is seasoned with soy sauce and vinegar, paprika and cumin. Then its stir fried in a wok along with onions, roma tomatoes and french fries. It all comes together for some rib stickin’ comfort food. 1 lb Cooked French fries. In a medium sized bowl combine salt and pepper, cumin, paprika, soy sauce, aji amarillo paste and vinegar. Add in the sliced beef and set aside to marinade for about 15 minutes. In a large wok over medium high heat, heat up 1 TBS cooking oil until it shimmers add the chopped scallions and garlic, Drain the beef but retain the liquid and place the beef into the hot wok an stir until the meat has browned on all sides. Remove the meat and set aside. Add the other TBS of oil to the wok and add in the onions and yellow bell pepper, cook until the onions become translucent. Add the meat back into the wok along with the reserved marinade and stock. Turn down the wok to medium and let the sauce reduce by half. Add the French fries and tomatoes and let the fries and tomatoes warm back up, which will take about a minute. Its ready to serve. *Aji Amarillo Paste is available in Latin Markets, If you can’t find it, leave it out and use more yellow bell pepper. 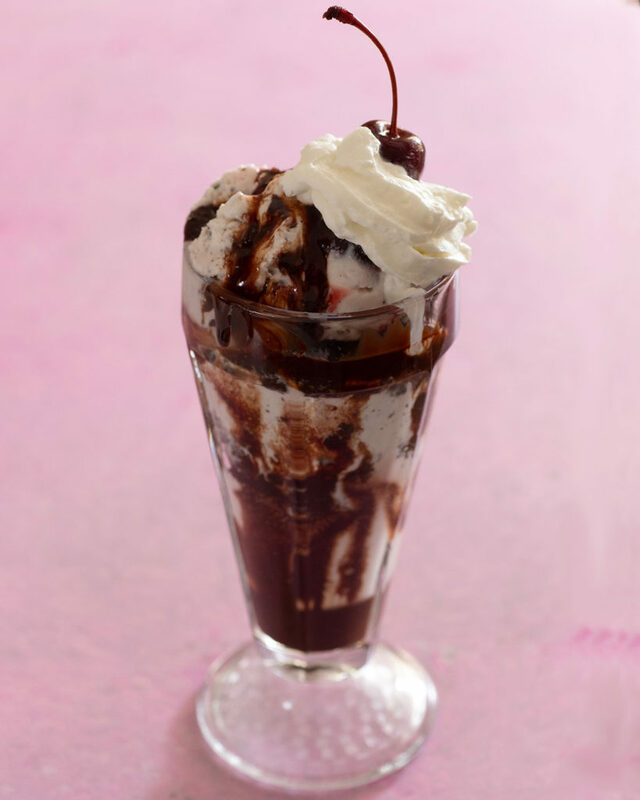 Cherry Chocolate Sundae with chocolate sauce and my homemade interpretation of Ben & Jerry’s Cherry Garcia Ice Cream. You may have been able to figure out that I’m a bit of a food nerd, so one of the things I like to do to keep my mind occupied (especially at work when I’m frequently doing repetitive/tedious tasks) is deconstruct recipes in my head. Mostly to try to figure out a way to make a well known recipe using equipment/ingredients I have at home or to be able to sub in and out ingredients because of allergy and intolerance issues. I’ve posted in the past about using coconut milk as a substitute for heavy whipping cream in ice cream recipes (you can see other ice cream related posts here) to reduce the amount of total lactose. This week’s recipe uses that same 1 to 1 whipping cream to coconut milk substitution. While this recipe is lactose free, because I use sweetened condensed milk for the sweetener, it should be a little more gut friendly than traditional ice cream. Out of all my attempts to make home-made versions of recipes, I think this one comes the closest to matching the original. Give it a try and let me know how you like it. 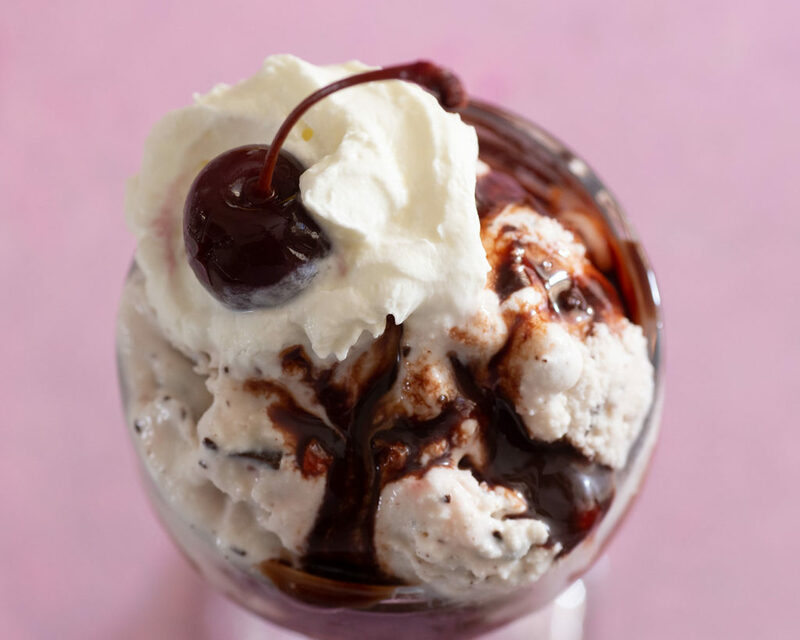 In a large mixing bowl, combine the ingredients for the ice cream base and stir until everything is well mixed, Pour into your ice cream maker and churn according to the manufacturer’s directions. Towards the end of the churn time, add the chocolate and cherries into the base and let churn for a few more minutes to allow the chocolate and cherries to distribute through out the ice cream. If you like your ice cream super soft you can eat it immediately, otherwise package ice cream into freezer safe containers and let chill for a minimum of 4 hours or overnight. This will allow the ice cream to harden. *note: Food grade oils are better than extracts for using in ice cream, they are more intensely flavored and the oils stand up to freezing better than water and alcohol based extracts. You can find them online or at specialty cake decorating/candy making shops. LorAnn is the most common brand.The typical substitution of essential oil to extract is ¼ tsp essential oil to 1 tsp extract. 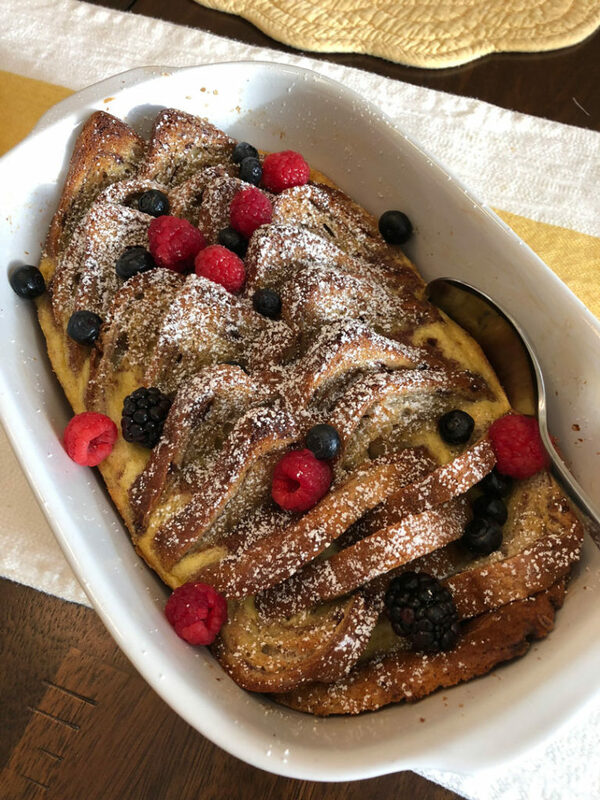 This weeks recipe is a super easy way to make French Toast for a crowd. Typically if you’re making French Toast or pancakes for a large group, there’s inevitably someone waiting around hungry while whoever’s cooking is furiously trying to get fresh and hot pancakes/French Toast served as quick as possible. Not only is this extremely stressful for the cook it’s not particularly conducive for folks to gather around the table and eat at the same time. Essentially what we’re making here is a French Toast Casserole or bread pudding. For added convenience, I used store bought, pre-sliced cinnamon bread that I cut diagonally and let sit out on a wire rack for an hour so that it would start to stale. This allows the bread to absorb more of the custard without becoming a soggy slimy mess. Alternately you can toast the bread but that’s one more step and this is all about ease and convenience. Spray a large casserole pan with cooking spray or coat with butter and set aside. In a large bowl, mix half/half, eggs, sugar, salt and cinnamon until well combined and set aside. Arrange sliced cinnamon bread in the casserole dish and then pour the custard mixture over the bread. Let sit for 15 minutes to ½ hour so the custard can be absorbed by the bread. Preheat oven to 350F. 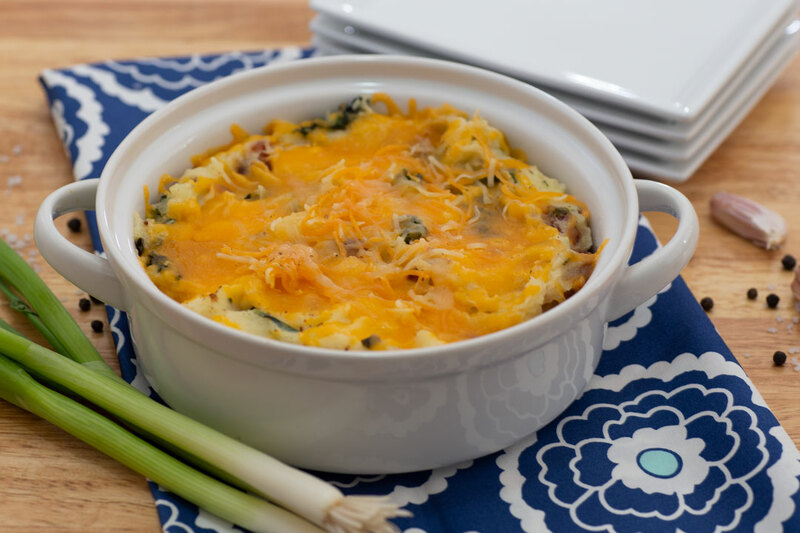 Bake casserole at 350F for 45 minutes to 1 hour or until the egg mixture is set in the middle. To serve, dust with powdered sugar and top with fresh berries. That’s it, and it’s that easy. There’s this misconception that a lot of people have that baking is super complicated and requires people to be super precise. I argue for most cakes, muffins and cookies that home cooks are inclined to attempt, that’s not the case. Like with all cooking, being organized is the secret to success. Reading the recipe thoroughly a few times, assembling and prepping all your ingredients before starting any part of the cooking/baking process is essential to a successful result. One of the things I like about baking, is that by simply swapping out an ingredient here and there you can completely change the flavor profile of what is essentially the same recipe. Case in point…the cake pictured above is the same base as the Peppermint Chocolate Layer Cake from a few months ago. I just swapped out white chocolate for the cocoa and dark chocolate and swapped out citrus for the peppermint oil and instead of crushed peppermint candy between layers, I used sprinkles and crushed Belgian Butter Cookies and Corn Flakes. Then I used the same method for assembling the cake. Otherwise the only other thing that was done differently, is that I baked the cake in 2 sheet pans and then used the outer ring of my springform pan to cut out the individual layers. It turns out that the cake cooks more evenly, faster and the top is more level than if you use round cake pans. So my hope is if you learn anything at all here its that you discover that these are just ideas and you can riff off of any of them by changing ingredients here and there. Place a clean glass or stainless steal bowl over a pot of lightly boiling water to make a double boiler. Break the chocolate into small chunks and place into the bowl, stir until all the chocolate has melted. Set aside to let cool. While the chocolate is cooling, assemble the rest of the cake ingredients. In a large bowl, combine, flour, sugar, salt, baking soda and set aside. In another bowl, mix the oil, water, sour cream, vanilla extract, citrus extract and eggs lightly until combined then slowly pour into the dry ingredients. Mix until just combined by hand or with an electric mixer. Slowly mix in the melted chocolate. 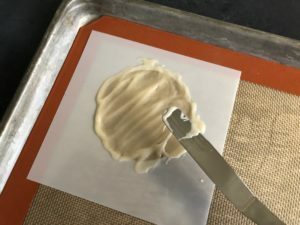 Divide batter evenly between 2 prepared ½ sheet pans and bake at 350F for 45 minutes or until a toothpick comes out clean. Remove from the oven to cool on a wire rack for 30 minutes, then remove from the pans and let cool completely before icing. Use a double boiler or microwave to melt white chocolate chips and set aside to cool. 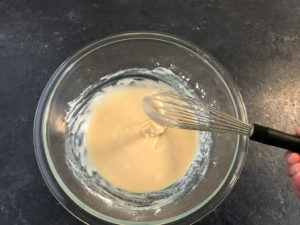 Once the white chocolate has cooled but is still liquid, whip butter in a large bowl or stand mixer with whisk attachment on high speed until the butter turns pale yellow. Scrap down the sides of the bowl add zest, vanilla extract, citrus extract and whisk on medium speed until flavoring is incorporated. With the mixer on low, slowly drizzle in the white chocolate and add the corn syrup*. Turn the mixer off and scrap down the sides. Add ⅓ of the powder sugar and turn the mixer on to low, mix until the powered sugar is thoroughly incorporated, turn off the mixer and scrap down the sides between each addition. Continue until all the powdered has been added. You should hear the motor of the mixer slow down. Now gradually start adding the heavy whipping cream. Your looking for a nice spreadable/pipable texture that’s not too loose. The icing should be airy but still hold a peak so you may not need all the cream. Use the outer ring of a springform pan, or a make a 6″circle out of cardboard to cut out 3 layers from you sheet cakes. Crumble the remaining scraps, to use as your base layer. 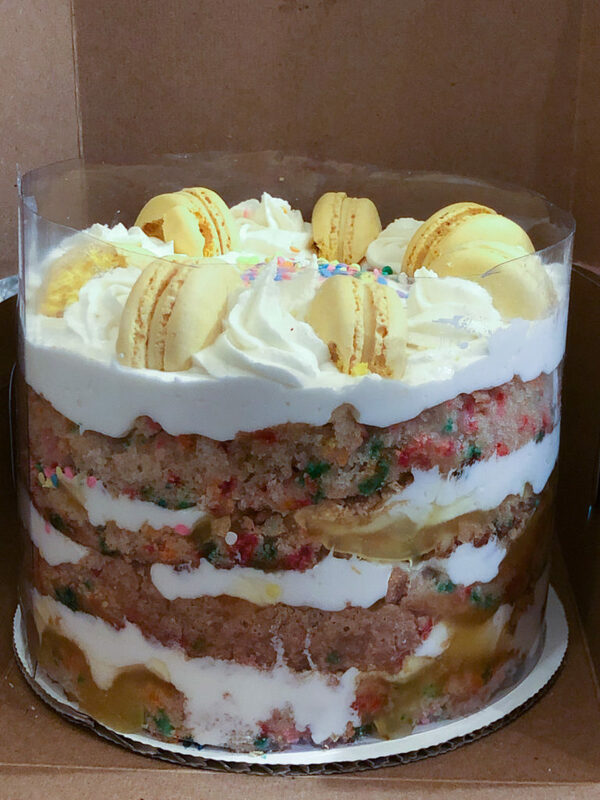 Slowly build your layers, cake, curd, buttercream, sprinkles and cornflakes. Then keep repeating that process. At the top, you can drizzle some lemon curd, or pipe buttercream roses and finish the rest of the sprinkles. 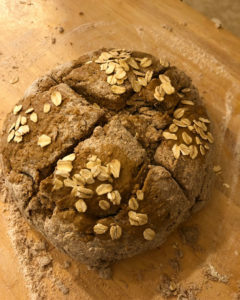 I try to bake something from scratch at least once a week and since St. Patrick’s Day is next week I decided to make Brown Bread. 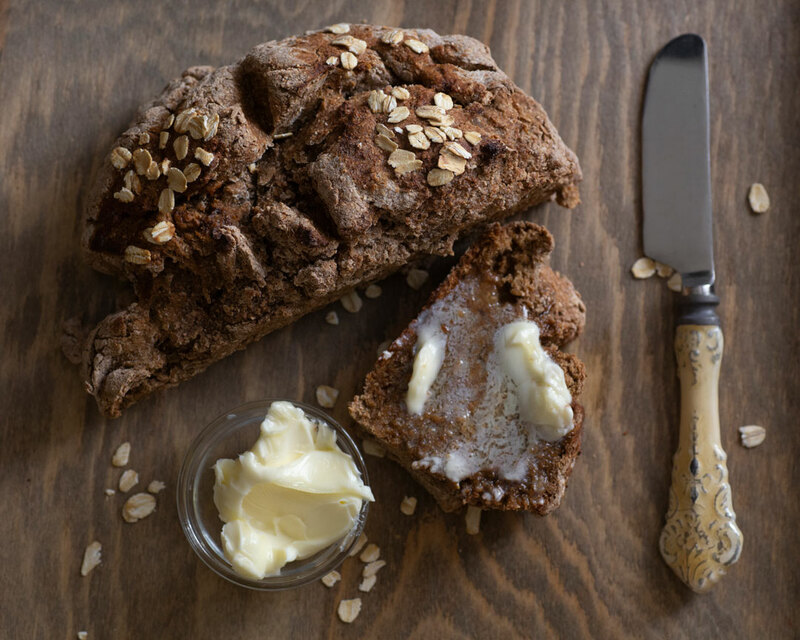 Brown Bread is a whole wheat quick bread that uses baking soda (bread soda/bicarbonate of soda) as the leavener instead of yeast. Its slightly sweet and dense in a stick to your ribs kind of way. I love it toasted with butter and a pinch of salt. Combine the dry ingredients in a large bowl. Mix the molasses, buttermilk and oil together and gradually add to the dry ingredients until a dough forms (you may not need all the buttermilk). Turn dough out onto a floured surface and knead into a ball. Score an cross into the top and brush with buttermilk and top with the oats. 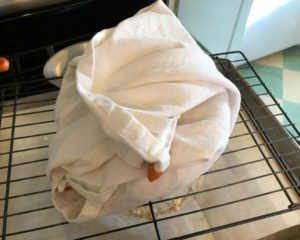 Place loaf onto a floured and parchment lined baking sheet and bake at 350F for 45 minutes or until the loaf has a hollow sound when you tap the bottom of it. Remove from the oven and wrap with a tea towel and place upside down on a wire rack to cool. This will help keep the crust from becoming too hard. To store, place in a zip top bag so the loaf stays moist. Shepherd’s Pie topped off with colcannon and a mix of cheddar and parmesan cheese. We’re trying to be better about planning meals for the week, so we’re going to give meal prepping a go again. This week I made Enchilada Suiza and Shepherd’s/Cottage Pie in large 9×13 casseroles that I froze as well as single serving portions for lunches and dinners this week. Since it’s March, and St. Patrick’s Day is a few weeks away I thought I’d share my recipe for Shepherd’s Pie/Cottage Pie. Shepherd’s Pie now refers to a casserole with any type of meat that’s topped with mashed potatoes but traditionally Shepherd’s Pie used lamb and Cottage Pie used beef. My version of Shepherd’s Pie uses ground turkey for no other reason than that’s what we had in the house and I top my pie with colcannon, which are super buttery mashed potatoes that are combined with sautéed garlic and kale. This recipe will be enough to make two 9×13 casseroles worth of Shepherd’s Pie. Here’s the recipe. In a large skillet, heat cooking oil over medium high heat until it shimmers. Add the onions, carrots and garlic to the oil and cook over medium high heat until they are soft and the onions start to turn translucent. Push the onion/carrot mixture to the side and add the ground turkey stirring frequently until the turkey browns. Add in the tomato paste, salt and pepper, and Worcestershire sauce mixing thoroughly so that the tomato paste is incorporated. Place the flour/starch into a bowl or measuring cup then add the stock. Mix with a fork until the starch/flour is dissolved. Pour into ground turkey and stir. Turn the heat down to medium low and let cook for about 5 minutes to cook the flour/starch then remove from heat and set aside. Place the peeled and cubed potatoes in a large pot and add enough cold water so that the potatoes are just covered. Add in 1 TBS of salt and bring to a boil. Boil over high heat until the potatoes are soft when poked with a fork. This should take about 15 minutes. While the Potatoes are cooking saute the kale, garlic in 1 TBS of bacon fat until the garlic browns and the kale starts to wilt. Season with salt and pepper and set aside. Once the potatoes are cooked, drain in a colander and then return the potatoes to the pot over medium low heat. Add the softened butter and cream and mash with a potato masher or use a hand mixer to mash. Taste for seasoning. Add in the crumbled bacon and sautéed kale and stir together. Preheat oven to 350F. Divide meat mixture and place into baking dishes flatten with a wood spoon. Top the meat mixture with the colcannon and then top with the grated cheese. Bake at 350F for 25 minutes until the cheese is melted. Enjoy. I was the happy beneficiary of some fresh passion fruit from one of my co-workers about a week or so ago. 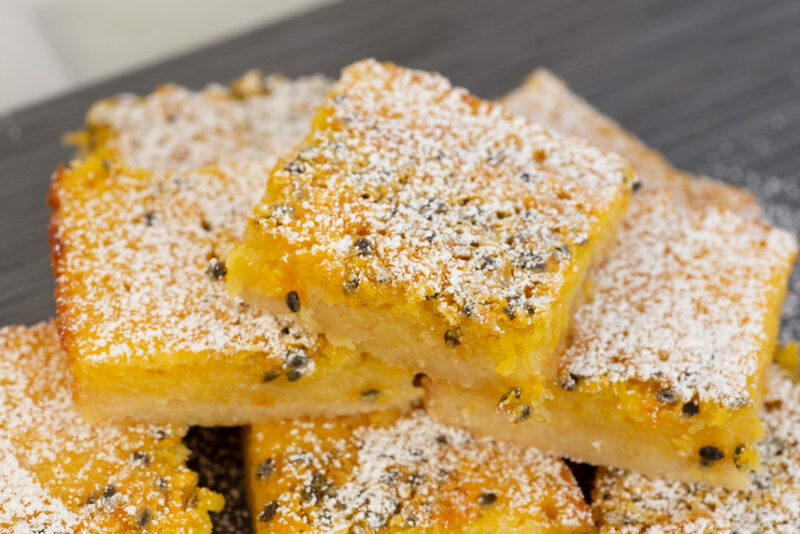 Well, they finally ripened up enough for me to use so I decided to make passion fruit bars. Passion fruit, is a somewhat sour acidic tropical fruit which lends itself very well to this application as well as being turned into curds as discussed in previous post or really anything that you’d use citrus. There’s two parts to this recipe, first is the shortbread base and then the curd that goes on top. You’ll need to bake and completely and allow to fully cool to room temperature before working on the curd topping. We have quite a few Vietnamese markets here that sell frozen passionfruit juice and its also available at our local Whole Foods. Look for one that doesn’t have sugar added, if you can’t find unsweetened, reduce the sugar in the filling by a couple of tablespoons. If you’re not able to locate passion fruit, use any combination of citrus juice you have available. You’ll need a 9×9 brownie pan to make this recipe. I’d suggest using a metal pan versus glass so the sides of the bars do not brown too much. In a large bowl mix all the ingredients by hand until it is a sand like texture. 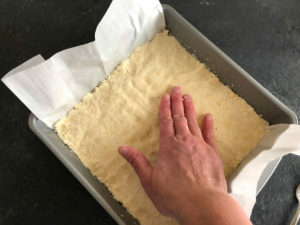 Press into a 9×9 brownie pan that’s been lined with parchment paper and spayed with cooking spray or greased with butter. Dock the dough a few times to prevent the crust from rising/bubbling up. 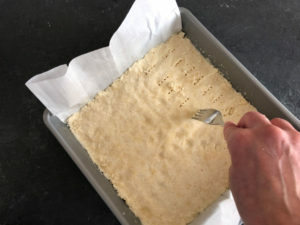 Bake crust in an oven preheated 325F and bake for 30 minutes or until shortbread turns a light golden brown along the edges. Mix all the ingredients except for the flour together until well mixed. 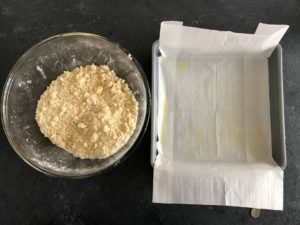 Slowly mix in the flour a tablespoon at a time until mix is free of lumps and the flour has been thoroughly incorporated. Pour filling mixture into the baked and cooled crust. Bake in an oven preheated to 350F for 35-40 minutes or until filling is set. Dust with powdered sugar and cut into squares to serve. So last week we celebrated Valentine’s Day. Invariably one of us winds up sick on Valentine’s Day so we don’t have a good track record of actually being able to complete any of the plans that we make. This year I decided to forego any attempt at making reservations or any elaborate surprises and shenanigans and decided to cook at home and to make one of my wife’s favorite meals, Chicken and Waffles. We’re fortunate enough to live a scant 2 miles from the Mecca of Chicken and Waffles, Roscoe’s (get the Obama Special). Roscoe’s does an amazing traditional Southern-inspired Chicken and Waffles along with all the traditional Southern sides. 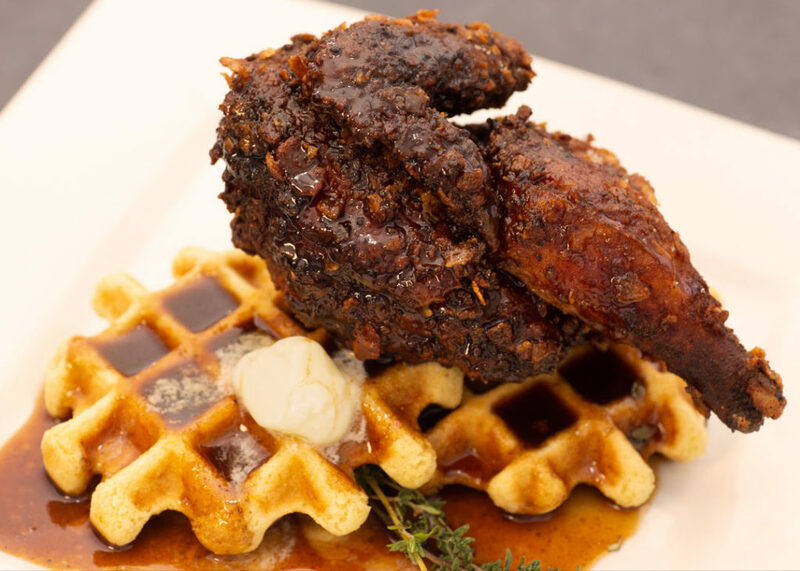 I love their Chicken and Waffles and wouldn’t dream of trying to emulate their recipes. But I will gladly use their recipe for inspiration. My flavor inspiration came from the Southwest and Mexico. I made a corn and jalapeño waffle and marinaded Cornish Game Hens overnight with buttermilk seasoned with Chulula Hot Sauce, cinnamon, allspice, nutmeg, oregano, cracked black pepper, salt and ground ancho chile. I dredged the game hens in seasoned flour and crushed up cornflakes before frying. For the syrup, I used a dark agave with melted butter, cinnamon and a bit of Doña Maria Mole in it. In a large bowl, combine cornmeal, baking powder, salt, dried corn, sugar and flour and mix a few times with a whisk to combine. In a blender, combine, the jalapeño, egg, corn, and creamed corn and blend until the mixture is smooth. Slowly mix the wet ingredients into the dry until blended then add the melted butter and blend until well combined. The batter will be grainy looking but try to work out the bigger lumps of cornmeal and flour. Set batter aside. Oil and heat waffle iron according to manufactures directions. Place a wire cooling rack on a baking sheet and heat oven to 250F. 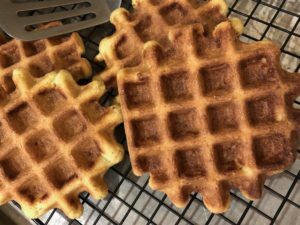 Place cooked waffles in oven to keep warm. Place all the ingredients in a 2 gal sized zip top bag add the chicken and marinade in the fridge overnight or for at least 4 hours. Fill a cast iron skillet of dutch oven to half full with cooking oil and heat cooking oil to 360F. Place ingredients into a paper grocery bag, Remove chicken from the marinade and remove excess marinade. 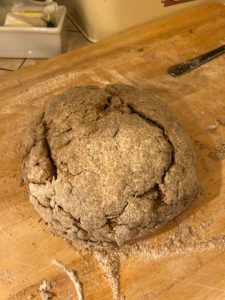 Toss into the season flour and knock off the excess. 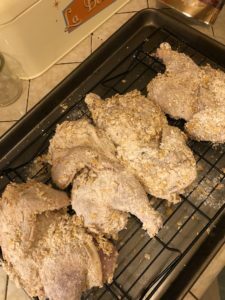 Cornish game hens dredged in seasoned flour an crushed cornflakes. Place on cookie sheet with a wire rack and continue to dredge all the pieces of chicken. Fry until internal temperature of chicken reads 165F on an instant read thermometer. 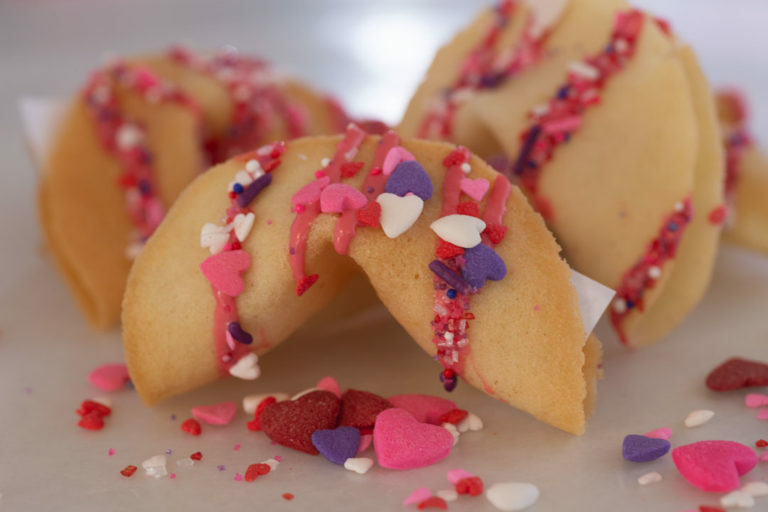 Homemade fortune cookies decorated for Valentine’s Day. Every once and a while as I’m wandering around Pinterest and Instagram I see an idea that I find inspiring and I try to reproduce it or riff off of it and usually it works out how I imagined it in my head. 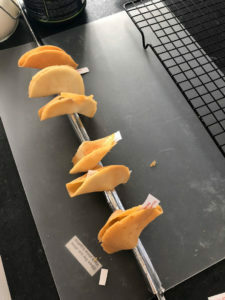 So, with it being Lunar New Year (’cause I tend to write posts a week ahead) and with Valentine’s Day coming up I thought I’d try my hand at making fortune cookies from scratch. I love the idea of being able to customize the fortunes as well as the cookie itself being an interesting package to hide surprises. Seems perfect for Valentine’s Day, right? I can deal with doing a lot of seemingly tedious culinary tasks. I can spend hours decorating cookies and using tweezers to apply sugar pearls and such to cakes and cookies. But I have to admit these fortune cookies are a little too tedious for me. The recipe I’m going to share will make 2 dozen fortune cookies. But I actually made 10 and called it quits. The batter is super easy but the tedium comes into play with baking them 2 at a time. Then putting the fortune into the hot from the oven cookie before the cookie cools too much and starts to crack. And off course accomplishing this without burning your fingers. Turns out this is much easier said than actually done. So cool idea but a bit of a PITA. Good luck and may the odds be in your favor. In a large mixing bowl, mix the eggs and sugar with a wire whisk until the sugar is dissolved. Then mix in, salt, extracts and flour. The batter will be really thick and that’s ok. Slowly drizzle in the melted butter and continue to stir until the batter is the consistency of instant pudding. 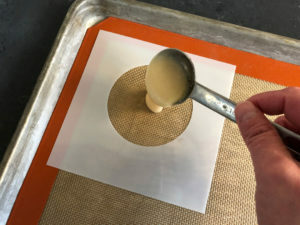 Using a silicone mat, spread 1 TBS of the batter into a 3 ½ round. Try to spread the batter as evenly as possible. Bake the cookies at 375F for 5-8 minutes or until they start to brown around the edges. Remove them from the oven and place onto a cooling rack. 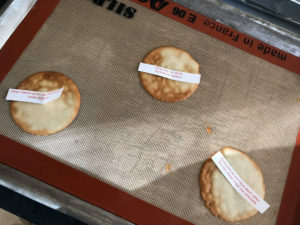 Immediately use a metal spatula to loosen the cookies from the mat and place the fortunes in the middle. Slowly press the edges of the cookie together (the cookies will still be hot to the touch) and fold over the edge of a cookie sheet or glass. I used a metal ruler I had laying around. Allow to cool and decorate as you like. These should be eaten same day. Since there are no preservatives in them, they a susceptible to humidity. © 2013-2019 Sam Foster Studios. All rights reserved.